There's a new opening restaurant in the center of Surabaya. And it's surprisingly a nice place! lol.. When I first got the invitation, I saw the name of the place, and I told my friends, "I think I'm going to pass this one.." Because I thought it was literally a 'Kedai' or just a small restaurant without anything special in it. Besides, coming to a newly opening restaurant is not as exciting as it was anymore (tell you guys later). But then a friend of mine sent me the picture of this place, and it was way much more than I've had expected. So what is it? Where is it? How is it? Curious much? Hihi.. Let's get down to the R-E-V-I-E-W! As I said before, Kedai Tua Baru is located in the center of Surabaya. If you know Eat & Eat, Kedai Tua Baru is in front of Eat & Eat's Exit Road. If you still don't understand, I hope the map that I attached on the bottom of the post will help. You can click on the "MAP" sign on top of the map, because I always redirect it to one particular link so that you can open the map on your phone's application just with one click. Though I've seen some of the pretty pictures of the place that surprised me before, I got another surprise when I actually got there. This place is turned out to be huge! LOL. Even my 16mm lens still couldn't cover their board sign (top picture) haha.. I know I've been telling myself to not judge a book from its cover, but some places just got me like this. When you first enter Kedai Tua Baru, you will see the cashier on your right, and on your left, there's a section where you can take your OOTD pictures (top left pic). The decoration was nice, also Instagram-Friendly. And along with that section, there was their open kitchen where you can have your order right away (bottom left pic). Just read the instruction board (top right pic), and you're good to go. Anyways, can you see how pretty the gradation of the tiles from ceramics to the wood on the top left picture? <3 So artsy! I could sense that they really wanted to bring the Market Atmosphere into the restaurant, and actually, this reminds me of the food court in Kota Kasablanka Mall, Jakarta, it's quite similar. Does anyone of you notices? On the right side or the restaurant, there's a small outdoor section, with colorful pavement and lots of bird cages hanging around for the decoration, Not to many tables in here, but I guess it can be a good smoking area for the customers who can't smoke inside. On the middle section of Kedai Tua Baru, there's a stair to the second floor (top left pic), but it was still closed for public. Then, there's also the Soup Bowl Station (top right pic) and the Drink Station (bottom right pic). Not only that, there's also a door that connected to their backyard, which was another of their outdoor section, but way much bigger than their right one. First and foremost, those lamps and those tiles were the two things that captured my heart on the back section of Kedai Tua Baru. Everything else? History! lol.. Kidding. I feel like the outdoor section here was the most alive section, because it's bright, and colorful! I love how they put a lot of plants all around, and though it's an outdoor area, they still have many air conditioners for us, so we won't feel hot or humid there. My MOST FAVORITE dish in here (all of my friends said that too!) is the Buntut Rempah! 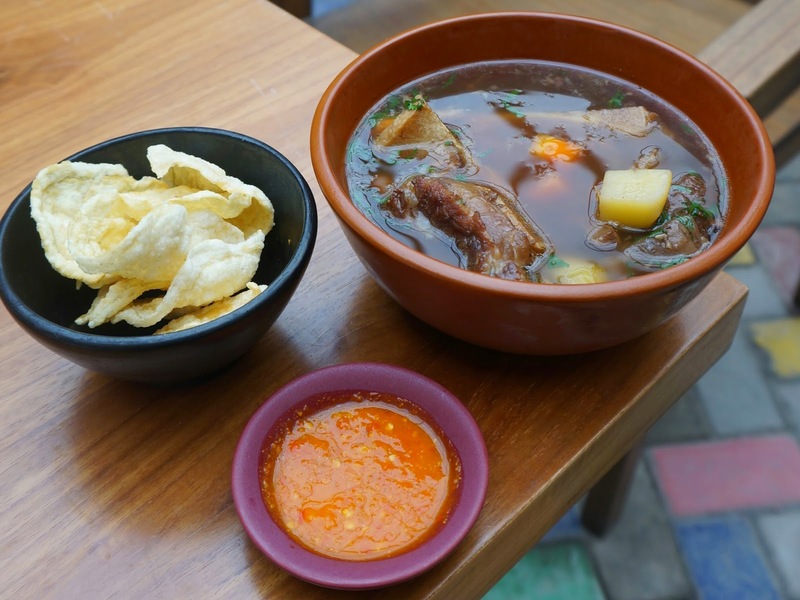 It's basically Oxtail with very rich spices! Kind of like Rendang. The runner up for my favorite dish in here was the Sambal Tua Baru Seafood Kombinasi. 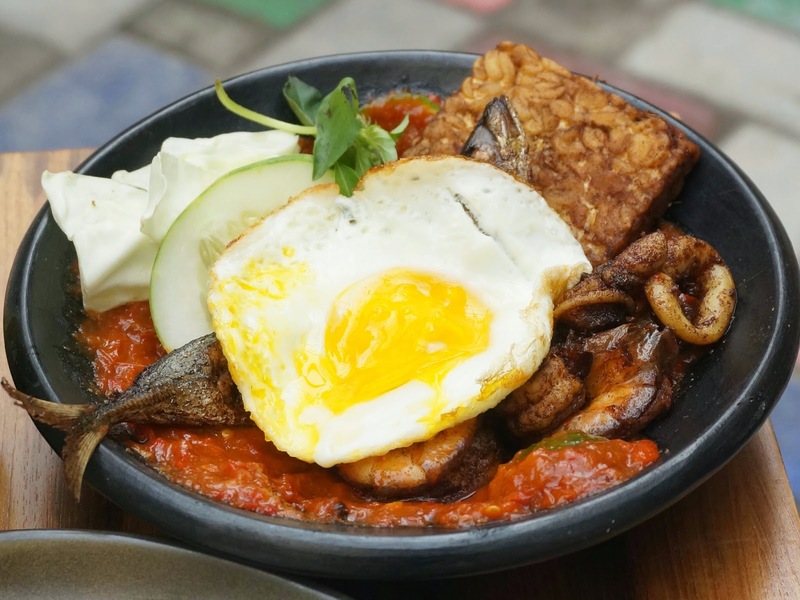 It's a plate filled with fried seafood combination and a sunny side up egg, but what raised the taste in this dish was their Sambal! I really liked it. My third favorite dish in here goes to the Rujak Cingur & the Sop Buntut. Because it's simply my fave food in general. For the drink, Lychee Tea was the most favorite drink that day I guess, because I noticed that my friend ordered this three times, lol. While for myself, I ordered Dawet, but I wasn't satisfied with it. So then I saw people ordering the Bali Hai, and I kinda interested to try. They called it Snowy Beer, because they freeze the beer in -4 to -7 degree temperature and when they are going to serve it, they will knock the bottom of the beer bottle with the beer opener, and it will crack the frozen beer inside the bottle and create a 'snow' inside. So when it's served, it's like a Slurpee Beer. Pretty cool! The place is big, enough to welcome more than a hundred customers, which has its own ups and down. Parking lot is pretty big, but I recommend you to take the Valet instead for easier access. Toilet is pretty clean, but for such capacity, I'm afraid you'll need more. Foods are good, still needs that special one to get people keep coming back again though. Price are unbelievably affordable for a very modern and comfortable place with a nice ambiance like this. And if you have kids, there's a special room for them to play in the back section. I think, overall, this place is suitable for lunch meeting, families, workers, and everyone who likes to eat Indonesian-Malaysian foods with a little modern touch inside the restaurants. From 1 to 10, I would rate this as 8. Jarang ngafe, hehe, mau nanya, kira-kira kalo tempat serupa di Surabaya, selain Kedai Tua Baru ada apa lagi ya Laura? Maksudnya yang harga terjangkau, interior bagus & cozy, serta bisa menampung orang banyak.. Totally not recommended... nasi goreng tidak enak, tempatnya biasa saja, pelayan judes judes. The first and last for me and my family.